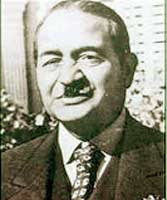 Shanti Swarup Bhatnagar also known as "father of research laboratories " was a renowned Indian scientist. The main area of his research were colloids, emulsions and industrial chemistry. He was born on 21 February, 1894 in Bhera, Punjab ( presently in Pakistan ). When he was eight years old, his father died. He was brought up in his maternal grandfather's house. He got his interest in science from his grandfather, who was an engineer. In his childhood he used to spent his time building mechanical toys. He joined the DAV High school, sikandarabad for his primary education. Later in 1911,he joined Dayal singh college, Lahore. He had B.sc degree in physics and M. Sc degree in chemistry. He completed his D. Sc degree from the London University. After completing his education, he joined Banaras Hindu University as a professor. With K. N. Mathur he developed the "Bhatnagar Mathur Magnetic Interference Balance". These device was a powerful instrument to measure magnetic properties. It was manufactured by a British company. Later, he moved to Lahore as a professor of physical chemistry and director of university chemical laboratories of the Punjab University. His work in the applied and industrial chemistry was notable. He solved many industrial problems and rewarded many times by the industrialists for solving there problems. But he didn't used the money for his personal benefit, he used it for strengthening the research facilities at universities. After the independence of India, under the chairmanship of Dr. Bhatnagar, CSIR ( council of scientific and industrial research ) was established. He became the first director general of CSIR. In his leadership 12 national laboratories (such as Metallurgical Lab at Jamshedpur, Central Food Processing Technological Institute at Mysore, National Physical Laboratory at New Delhi, National Chemical Laboratory at Pune) were established. Besides science, he also had interest in poetry. He wrote the Kulgeet of the BHU. He also wrote a play called Karamati. In 1941, he was knighted for his contribution in science. In 1943, he was selected as a member of royal society. He was awarded Padma Bhushan in 1954. He died on 1 January, 1955. After his death, CSIR started Shanti Swarup Bhatnagar Award for the eminent scientists to recognize their work.